Manuel’s shares as a contributing author in this book a personal story of finding home in the way she walks. She pays homage to her ancestors. (There is no title of her piece. It can be found on page 201). 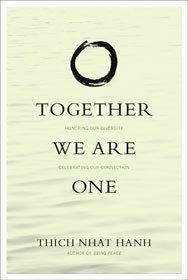 Although Together We Are One is based on Thich Nhat Hanh’s teachings given to Buddhist practitioners of color, readers of all backgrounds and walks of life can appreciate this inspirational and practical guide. In chapters focusing on honoring our ancestors, developing understanding and compassion, and seeing the world in terms of interbeing, Nhat Hanh shows how meditation and the practice of looking deeply can help create a sense of wholeness and connectedness with others. Chapters are interspersed with mindfulness practice exercises and the personal stories of skilled writers, such as Larry Ward (author of Love’s Garden), and Sr. Chan Khong (author of Learning True Love). Covering the discovery of a spiritual path, the experience of finding balance, and overcoming obstacles in an unpredictable world, Together We Are One is a valuable addition to the unique expression of Buddhism in the West.